Sometimes it takes a major commitment to make progress. The fear of letting others down causes us to get it done! So what did I get done? Sufficient progress on the railroad room to allow me to set up the modules, and set them up I did. They have been connected and leveled. Track put in, DCC setup and vacuumed! Yes, vacuumed to clean off layers of saw dust, so that they resemble Maine more than Arizona. It feels good to have trains running again…. So what was the motivating commitment you ask? 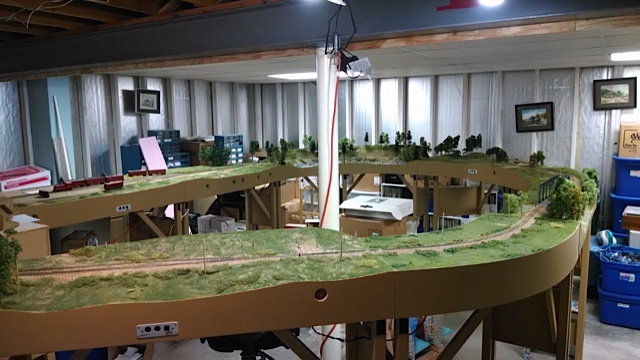 2014 NMRA National Convention (Train Show) in Cleveland, OH….The Sn2 crew will be there in full! It should be our largest setup up yet. With a commitment, comes a todo list….More on that in future posts! This entry was posted in Events, Free-mo, NMRA. Bookmark the permalink.